One thing I've had to learn in order to keep my head above water is that sometimes you just have to say 'No'. Our plates are already so full, but it seems like there is always someone ready to add more. I used to feel like if someone asked me to do something, then I needed to agree to it. It was the nice thing to do. It was the loving thing to do. It was what a good Christian (and Pastor's Wife) did. At some point, though, I realized that in trying to be nice and loving to people, I was destroying myself. Let's face it ... we can only do so much. You need to figure out what your limits are. Some of us (me included) aren't like so many super women out there and aren't able to go, go, go 24 hours a day. Each one of us needs to learn what we can handle. Then we need to do what we can do ... and do well. Instead of spreading ourselves so thin that we can't do anything well, we need to do only the things that we can realistically accomplish. When presented with an opportunity, you need to decide a few things. First, ask yourself if you have time. There are many great opportunities in life, but only so much time. We have to pick and choose the things we can do and fill our time with. We need to prioritize things. If you have time, then you need to decide if this is something you want or feel called to do. If it is something big, you probably need to spend time in prayer about this. When someone asks you to make a large commitment, learn to tell that person that you'll need time to pray about it and will get back to them. Then, make sure you actually pray about it (and get back to them, too). Allow God to lead you. Now, I don't want you to take things too far the other way and never do anything to help someone else. You need to find that perfect balance, where you are doing things in service to others while at the same time not over committing yourself. That balancing point will be different for each one of us, so you need to find your own sweet spot. Remember ... saying no does not make you a bad person!! Keep your sanity and learn to say no. 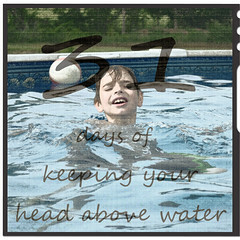 It is imperative in keeping your head above water.